Most people have never heard of Reinhard Heydrich. This may be because he was died early in World War II from injuries sustained in an attempted assassination by Czech agents. But this man lived long enough to bring about the deaths of millions. Among his war crimes, Heydrich, who was the second highest ranking officer in the SS, thought up the pretext to invade Poland and launch the war, and he drafted Hitler’s "Final Solution," a Nazi attempt to exterminate the entire Jewish population of Europe. The German officers who knew Heydrich nicknamed him "The Blond Beast." They said he had an insatiable drive for power. A classic narcissist, the man was described as a cold, calculating manipulator who lacked human compassion. In a different world Heydrich might have left his mark in greatness. He grew up in a cultured environment, was a serious violinist, and had every opportunity to enjoy a great career in music. He excelled in education and became a talented athlete, taking awards in fencing. The German defeat in World War One brought social chaos, inflation and economic ruin to most German families including Heydrich's. In March of 1922, at age 18, Heydrich sought the free education, adventure and prestige of a Naval career and became a cadet in the small, elite German Navy. He rose in rank to second lieutenant in the intelligence division. But he got involved in a scandal with the daughter of a shipyard director and was forced to resign his Naval commission in 1931 for "conduct unbecoming to an officer and a gentleman." Heydrich then joined the Nazi Party and became part of the elite SS team. His appearance as a tall, blond haired young officer, and his personal response to a questionnaire caught the attention of Heinrich Himmler, head of the SS. Himmler hired Heydrich to build an SS Security Service. His work as an internal spy earned him a quick rise through the ranks. Within two years Heydrich held the rank of SS Brigadier General. The Nazi Party seized power in Germany in 1933. Heydrich and Himmler oversaw the mass arrests of Communists, trade unionists, Catholic politicians and individuals who opposed Hitler. There were so many arrests that concentration camps were established at Dachau, Buchenwald, Sachsenhausen and Lichtenburg. In 1934, Himmler took control of the Gestapo, the Nazi Secret Police. Heydrich was his second in command and put in charge of running the Gestapo. By 1937 the Gestapo were given unlimited powers of arrest. People were arrested sometimes without cause without trial or legal recourse. It was a time of great fear. Just saying the wrong thing could lead to the arrest and possible "disappearance" of a citizen. Gestapo agents under Heydrich used torture, murder, extortion and blackmail. Heydrich became one of the most feared men in Germany. Heydrich was involved in framing two powerful but traditionalist German army generals, War Minister Werner von Blomberg and Commander in Chief Werner von Fritsch. The two men were forced out of office. Hitler then assumed the title of Commander in Chief of the German Army. Next, Himmler and Heydrich helped build the Nazi party influence in neighboring Austria and Czechoslovakia. By 1938 the two countries annexed to Germany. Heydrich then established the Gestapo Office of Jewish Emigration. An estimated hundred thousand Austrian Jews were forced to flee, leaving all of their worldly possessions in the hands of the SS. The project was so successful, Heydrich set up a similar office in Berlin. The Czech government surrendered to Hitler under threat of invasion on October 1, 1938. That year, on Heydrich's order, 25,000 Czech/Jewish men were apprehended and sent to concentration camps. By now there were hundreds of concentration camps established throughout the territory. The Nazi invasion of Poland occurred on September 1, 1939. 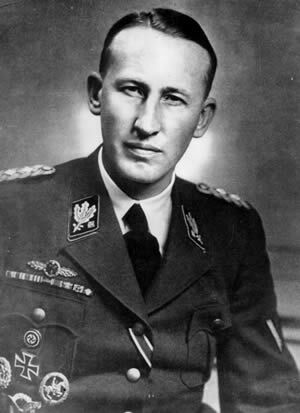 Heydrich had engineered a fake Polish attack on a German radio station at Gleiwitz, a mile from the Polish border. This gave Hitler an excuse for the invasion. This was the official start of World War II. At this time, Heydrich was put in charge of a newly created Reich Main Security Office which oversaw the SD, Gestapo, Criminal Police and foreign intelligent service under one central roof. It was the beginning of a mass killing of people on a scale unprecedented in human history. German officers systematically rounded up and shot Polish politicians, leading citizens, professionals, the aristocracy and even the clergy. Poland's 2 million Jews were either shot on the street or were crammed into ghettos where they starved to death. The rest of the people were sent to concentration camps. It was a movement by Heydrich to follow Hitler's plan for the complete destruction of Poland as a nation. During the Nazi invasion of the Soviet Union in 1941, Heydrich organized the mass execution of Communist political commissars and others suspected of being a security threat. After this, attention was turned to the mass murder of the Jews. The people were ordered to hand over their valuables, then stripped naked and marched to a place of mass execution. They were shot kneeling or standing before a dug ditch, and their bodies thrown into the ditch for mass burial. In the end, it was said the Heydrich was responsible for the mass murder of millions. Heydrich died in early 1942 after a special Czech attack team, trained in England, attempted an assassination. As Heydrich’s car slowed for a sharp turn in the road, they shot at the car and exploded a bomb which wounded Heydrich, but did not kill him. Heydrich managed to get out of the car, draw his pistol and shot back before he collapsed. The wounds Heydrich sustained in the attack led to his death from blood poisoning nine days later. The Nazis staged an elaborate funeral. Since that day, however, the man’s name has been almost forgotten.